30 years after Back To The Future was released, the movie is still widely adored by critics and fans alike, and it appears that Universal Pictures has something special planned for us to mark the anniversary. 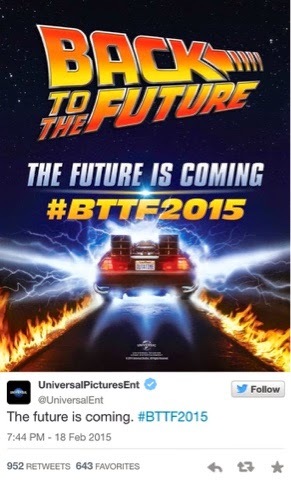 The rumour mill went into overdrive after this cryptic tweet by the company earlier, and now the hashtag #BTTF2015 has people wondering if a reboot or remake may be on the cards. Of course, it may be something much smaller, as writer Bob Gale revealed last year that the 30th anniversary would be celebrated in some way, so talks of another movie are very premature. Perhaps more realistic is some sort of retrospective on the franchise, as the events of Pt II take place in October 2015. We may even have to wait til then to get some answers. Whatever happens, The Movie Bit crew will have our flux capacitors on full charge, ready to hit 88mph and take one more trip to Hill Valley with Marty & Doc Brown.